Nouns / phrases: Communication in general, in all its forms: face-to-face or through a medium; written, verbal, non-verbal. Document, letter, email, a speech; facial expressions and gestures. Conversations, especially ones that take time and effort. Information. Expression. Something is, or should be, expressed. 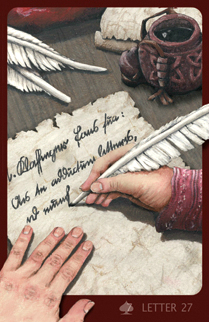 Traditionally, written communication (letters, documents etc.) or at least not face-toface communication only! Activities: To communicate. To write, talk, gesture, converse. To inform, to share information, to report. To relate or express something. Attributes: Written, spoken, communicated. Communicative, talkative, expressive, eloquent, telling, informative. As a person: Someone who is communicative or who you communicate with a lot. Pen pal. Someone whose profession contains a lot of communication, such as the host of a radio show, a mediator, a speaker. Informant, whistle-blower. As advice: Don't keep it to yourself! Communicate about it! Inform others! Time factor *) : You'll be informed when. When you get the relevant information.